Volatility returned to markets last week as the Dow Jones Industrial Average pared gains for the year. For the week, the index dropped roughly 4% reducing the one-year price gain to 28%. Last week’s 3.8% decline in the S&P 500 is hardly unheard of, although it hasn’t been seen recently. Since 1926, there have been more than 230 weekly declines of 3.8% or better. However, it has been over 107 weeks since we last saw a weekly drop of this size, and the S&P 500’s return has been nearly 50% since then. The long history of stock market returns shows again and again that stock values are ultimately tied to the size of the underlying economy. 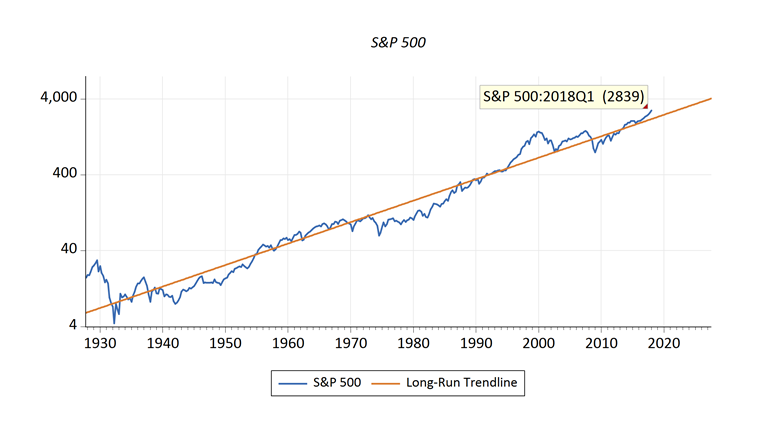 The chart below shows the value of the S&P 500 compared to its long-run trend over a very long period of time. We continue to see signs of synchronized global economic growth (chart, below). The pattern of coordinated growth has been supported by a positive, but moderate, degree of credit expansion. 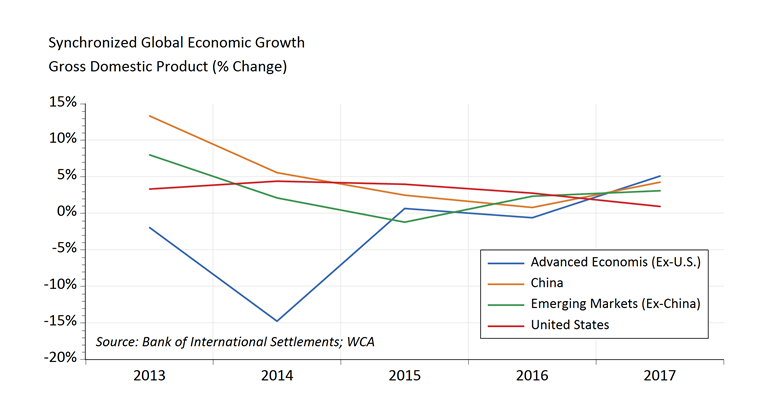 According to data from the Bank of International Settlements, the year-over-year change in core debt to the non-financial sector rose 2.9% across advanced economies and 3.1% across emerging economies through the second quarter of 2017. This represents a pickup in credit creation in advanced economies from -2.5% growth in 2014, and a moderation in emerging markets from 13.1% growth in 2013. China’s credit growth has slowed to 4.3% growth from 22.9% in 2013. Underlying steady and coordinated economic growth supported a nearly $30 trillion rise in global stock market values to $85 trillion since the global slowdown of 2014-2015 came to an end.